Slam Dunk The Junk - Berkeley Heights Clean Up Day! 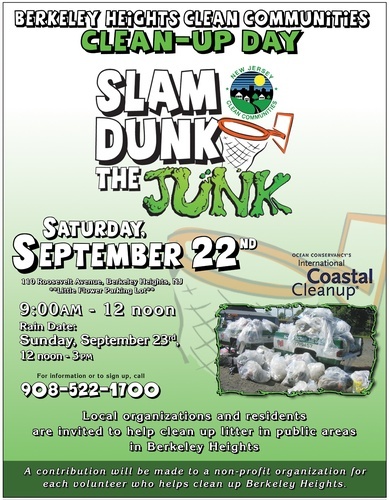 Name: Slam Dunk The Junk - Berkeley Heights Clean Up Day! Local organizations and residents are invited to help clean up litter in public areas in Berkeley Heights. Participants are invited back afterwards for hot dogs, drinks and games! Saturday, October 22nd, rain date Sunday October 23. No Fee- each volunteer will be "paid" $10 for their time, to be donated to the charity of their choice.